When people think scuba diving, they think Great Barrier Reef. As one of the seven wonders of the world, the Reef often overshadows all other areas diving, although the rest of Australia is just as fascinating. The Reef is truly magnificent. Of course, it ranks well in the top ten dive sites of Australia. It is over 2300 km long, covers 350 000 sq km of ocean and contains well over 2500 reefs, making this the largest Marine Park in the world. The fauna is diverse and abundant. Over 330 species of hard corals and 1500 species of fish live throughout the regions waters. The Reef is awe inspiring. It is colourful, graceful, lively, beautiful and simply amazing. Morays, rays, big fish, small fish, colourful fish, shellfish, sea stars, sea urchins, anemones, turtles, nudibranches – the list goes on indefinitely. Every dive brings something new. There are literally thousands of sites to dive and many areas of virgin reef seldom visited by divers. Amazing! 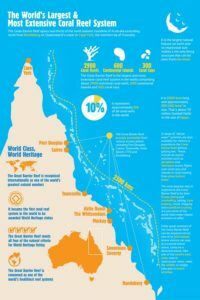 For Facts on the Great Barrier Reef follow the link. The Reef is an enormous system. It has suffered significant damage due to Coral Bleaching. In addition, certain people within the governing bodies of Australia seem not to appreciate the responsibility that Australia has for this priceless resource with comments such as some damage to the Reef in the course of Coal Mining is acceptable. A person could be excused for thinking that such a natural resource and economic source might be worth more than a Coal Mine and a billion dollar loan to the company developing the Mine, if “develop” is an appropriate word in this context. Just wish to say your article is as surprising. The clearness in your post is simply great and i can assume you’re an expert on this subject.Fine with your permission let me to grab your feed to keep up to datewith forthcoming post. Thanks a million and please continue the enjoyable work.